two or more surgeries for penetrating disease. His commentary indicates that a “‘wait and see’ approach is appropriate for most patients. He frequently will measure a calprotectin three months postoperatively and every three months and perform a colonoscopy typically 6-9 months postoperatively. Those with endoscopic recurrence will be placed on anti-TNF therapy. The most effective way to prevent recurrence is to initiate an anti-TNF within four weeks of surgery. 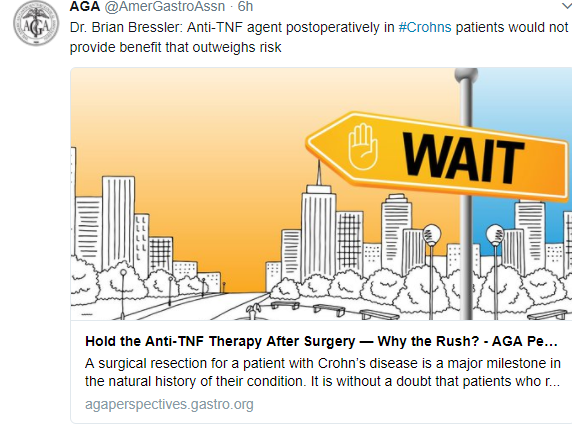 It has been my practice that patients at high risk for postoperative Crohn’s disease recurrence initiate anti-TNF shortly after they are discharged from the hospital. If a patient had been on an anti-TNF prior to the surgery, I will usually resume the same anti-TNF after the surgery. In these patients, I do not give a re-induction course unless they had not received the anti-TNF for more than three months prior to surgery. Concomitant therapy: “In the majority of patients, I treat with an anti-TNF, I will use a concomitant immunomodulator…One year after surgery, if there is no disease recurrence, I will decrease and often stop the immunomodulator. With the advent of therapeutic drug monitoring, I have a number of postoperative anti-TNF patients on monotherapy without an immunomodulator. [In] patients at moderate risk for postoperative recurrence… I perform an ileocolonoscopy six months postoperatively and, if there is evidence of endoscopic recurrence, I add an anti-TNF agent. After finding a high rate of recurrence in these patients, I am beginning to shift my practice to initiating anti-TNFs in this moderate-risk group as well. My take: I tend to favor Dr. Reguieiro’s approach in my patient population. This entry was posted in inflammatory bowel disease and tagged anti-TNF therapy, postoperative Crohn disease by gutsandgrowth. Bookmark the permalink.